A common defect in single crystal growth from solution is the formation of mother-liquid inclusions. In order to understand their evolution and improve the experimental procedure it is crucial to know their chemical and structural composition. Their fine-grained (< 5 µm) internal structure demands special requirements for EPMA measurements, realized by low-voltage (5 keV) elemental mapping applying a step size of 0.138 µm for each pixel (Müller et al. 2014). Alkali-ion migration out of the excitation volume has been a well-known challenge in electron microanalysis for the last decades. For the analysis of alkali-rich silicate glasses it is a necessary requirement to prevent this migration process. This could be successfully done by using an optimized operating protocol, applying beam current densities lower than 0.1 nA/µm² (Scherrer 2012). The groundmass of steam cured building materials consists of calciumsilicate-hydrates as tobermorite and semicrystalline CSH(I). 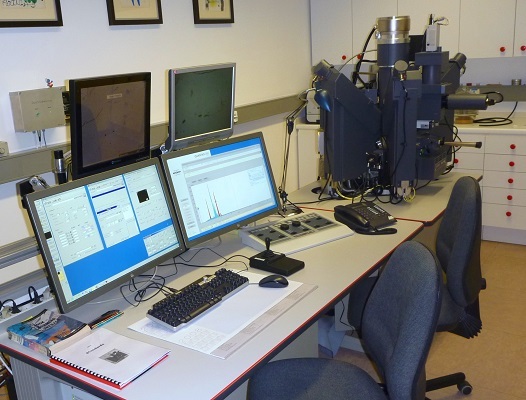 Their grain sizes are as low as 5 µm and they exhibit thermal instability under the electron beam. Knowledge of their composition is significant in order to determine the thermodynamic and kinetic properties of tobermorite-forming reactions. High resolution can be achieved by scanning the beam over a small area of 60x60 µm by concomitant reduction of heating up of the sample. By applying a special in-house developed beam-scanning method not only the composition, but also the amount of individual calcium-silicate-hydrates can be determined (Fehr & Zürn 2000). Scherrer M (2012): Characterisation of synthetic alkali-rich silicate melts by EPMA and viscometry, MSc thesis, LMU München. Fehr KT, Zürn SG (2000): Determination of CSH-phases by beam-scanning electron microprobe techniques. In: Rammelmair D, Mederer J, Oberthür Th, Heimann RB, Pentinghaus H (eds. ): Applied Mineralogy in Research, Economy, Technology, Ecology and Culture, A.A. Balkema, Rotterdam, 761-764.